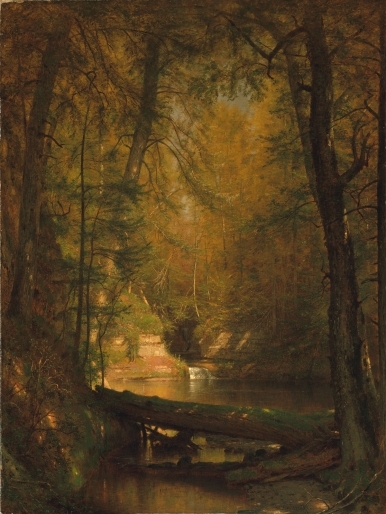 Thomas Worthington Whittredge (May 22, 1820 - February 25, 1910) was an American artist of the Hudson River School. Whittredge was a highly regarded artist of his time, and was friends with several leading Hudson River School artists including Albert Bierstadt and Sanford Robinson Gifford. He traveled widely and excelled at landscape painting, many examples of which are now in major museums. He served as president of the National Academy of Design from 1874 to 1875 and was a member of the selection committees for the 1876 Philadelphia Centennial Exposition and the 1878 Paris Exposition, both important venues for artists of the day. Whittredge was born in a log cabin near Springfield, Ohio in 1820. He painted landscapes and portraits as a young man in Cincinnati before traveling to Europe in 1849 to further his artistic training. Arriving in Germany he settled at the Dusseldorf Academy, a major art school of the period, and studied with Emanuel Leutze. At Dusseldorf, Whittredge befriended Bierstadt and posed for Leutze as both George Washington and a steersman in Leutze's famous painting "washington Crossing the Delaware", now in the collection of the Metropolitan Museum of Art in New York City. 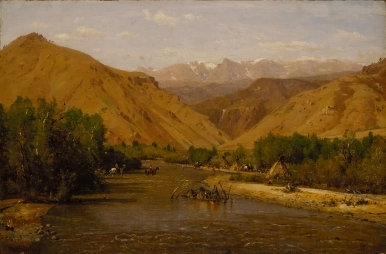 Whittredge spent nearly ten years in Europe, meeting and travelling with other important artists including Sanford Gifford. He returned to the United States in 1859 and settled in New York City where he launched his career as a landscape artist painting in the Hudson River School style. 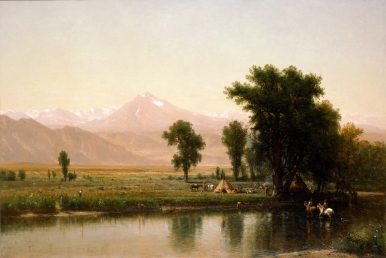 Whittredge journeyed across the Great Plains to the Rocky Mountains in 1865 with Sanford Gifford and John Frederick Kensett. The trip resulted in some of Whittredge's most important works - unusually oblong, spare landscapes that captured the stark beauty and linear horizon of the Plains. Whittredge later wrote in his autobiography, I had never seen the plains or anything like them. They impressed me deeply. I cared more for them than for the mountains... Whoever crossed the plains at that period, not withstanding its herds of buffalo and flocks of antelope, its wild horses, deer and fleet rabbits, could hardly fail to be impressed with its vastness and silence and the appearance everywhere of an innocent, primitive existence." Whittredge moved to Summit, New Jersey, in 1880 where he continued to paint for the rest of his life. He died in 1910 at the age of 89 and is buried in the Springfield, New Jersey cemetery. Whittredge's paintings are now in the collections of numerous museums, including the Metropolitan Museum of Art in New York City and the Smithsonian American Art Museum in Washington, DC.